Seeing as it now looks like my license may be years off, i'm looking into ways i can keep doing what i love doing without having to work around my mates schedule. Any recommendations on air rifles that could comfortably take a possum within maybe 50 yards tops? minimum 1000 fps in .177. I wouldn't be shooting at possums at 50 with most of your air rifles that you could get without a license. Tough buggers. If you are after possums Id say 22 cal. Bit more bullet weight for the head shots. Otherwise 177. I know that you can take out possums with grunty 177s, but like I said 22 for that. As @gonetropo said minimum 1000fps from a 177- usually the same model slug guns drop back to the 800s for a 22. Oh and once you start getting powerful, they can get real finicky over what ammo shoots well. And if they are anything like mine the triggers are shite. I did a roller mod to mine-made a big difference. I also tried it without the little spring but put it back in. I might take it back out though. I have a Crossman 1000 177 cal and have taken rabbits, possums, a few wallabies, magpies, etc. Some rabbits out to 50 odd yards but I think possums maybe a bit harder at that range, they can be pretty tough especially if you don't get a good head shot in first shot. I would limit the range to about 25 -30 yards especially on the tougher critters. My rifle only cost $200 new ( few years back now) and put a Gamo 4x scope (air rifle scope) on it and it has been an accurate and reliable gun. I prefer .22 cal for possums, has more energy and smack down power. Check out the Cometa Fennix and Fusion both good powerful air rifles with not a bad trigger. Forget the fps, this is a manufacturing claim which is usually achieved by using light weight pellets. The figures you want to look at is ft lbs, just harder to find any info than fps. Mintie and rewa like this. My Gamo scope is fine must have got a good one. I was leaning towards 22 cal so good to know i was looking in the right direction. I figured 50 would be pretty optimistic. Seriously dude it has accounted for HEAPS of possums - day & night. A well placed shot (head) they are dead before they hit the ground. Haven't used it much for rabbits so not sure about max range. 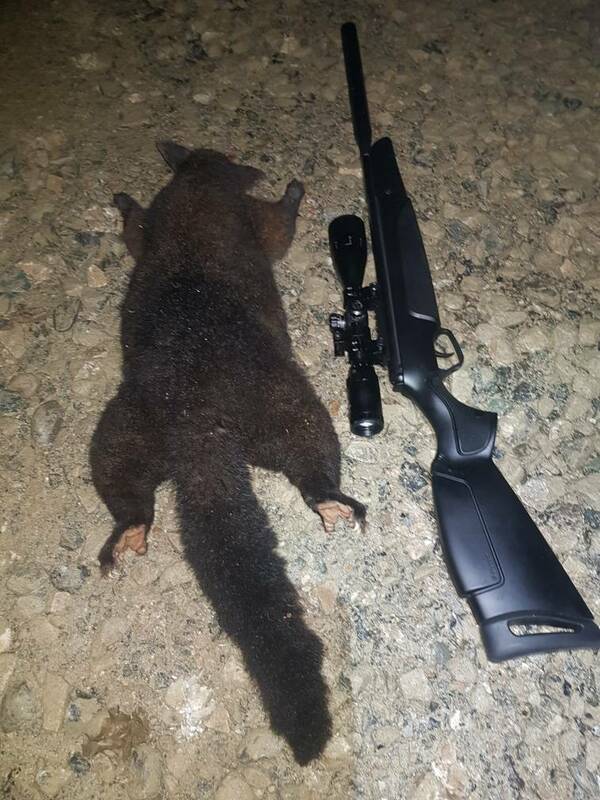 As you know...often a shot at a possum is from close to the bottom of a tree so distance not more than say 30m, at this range a quality .22 air rifle is deadly on possums. Good thing about the Stoeger's is the scope that comes with them is actually surprisingly good. Get one you won't regret it. Good luck & post sum pictures !! Got the same one-never shot anything other than targets though. interesting fact......a lombardy poplar argueably one of the tallest trees around is no more than 30 mtrs tall...most willows less than 10....... even a big blue gum is less than 30 high so any possum in a tree is within range for a shotgun and so is still in that 30 mtr range for air rifle.... pointed pellets in .177 arent as good as flat or rounded points for small stuff but for possums should help with penertration. I ran some of the 177 Daisy pointed hunting pellets over the chronograph - they were going a lot slower than the standard pellets (only about two-thirds the speed from memory). My guess is they weren't sealing as well so air was getting past them. This was over 20 years ago, so a fair chance designs have changed since then, but it's still worthwhile to try different pellets. Probably heavyer with the point. You can get pellets in all sorts of weights just like bullets.